One of the most annoying minor injuries that can happen to your dog is a cut pad! It's nigh impossible to bandage it as the dog will tear the bandage off its paw. Let's face it, dogs don't normally wear bandages on their paws! Even if you were to keep a bandage over the injury the cut requires air to help the healing process. Without a bandage the dog has to continue walking on its paw and this is hopeless because it is very difficult to help it heal quickly. It can actually make it worse and cause infection in the wound. Even on a lead the dog won't always walk on an area you would like him to walk over. So it becomes more sore walking on rough ground, perhaps becoming swollen with infection and the dog is continually limping. That happened to one of our dogs. 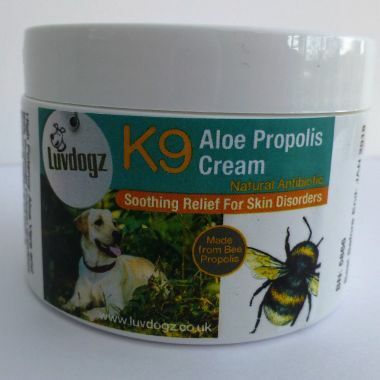 We tried all sorts of creams and dressings for over two months until our Vet gave up and suggested we find an aloe vera gel that also contained Bee Propolis. We bought some and cleaned and dried the dog's pad before rubbing some of this soothing cream in. It just worked miracles and within a week or two the cut on her pad healed up completely. Well our customers who have bought it have not only used it on dry and cracked pads but for all sorts of minor skin injuries. Sheila sent us some photos of her dog Milly who is a Springer x Colliel and Milly's sore pads on the inside of her back paws that don't touch the ground. Milly is an active little dog off the lead and who knows what she runs through. Whatever it was it was causing Milly some concern and she wouldn't stop licking it and making it more sore. "This is Milly, she is a two year old Springer X Collie and full of beans. She is forever hurting herself but this time she somehow managed to scrape the pads on her back leg. She did the damage at the weekend and after 5 days it still looked bad. I am sorry the photos aren't that great but she never stays still for very long. I first applied your cream on the Thursday and by Saturday it was much improved. I only managed to apply the cream twice a day. Just over a week later it is totally healed and Milly is back to doing what Millie does out on her walks!" It's quite amazing what skin problems our dogs pick up out on their walks. We are very prone to accept that all these minor skin disorders and allergies stem from the food they eat but who knows what is put out there on the grass! We had one customer whose dog developed red soreness between the toes on each paw. She rubbed our product inbetween her dogs toes and it cleared up within the week. So it can be really useful to keep a small pot in your medicine cabinet because it's not just great on dogs but it has been known to be helpful to humans to! 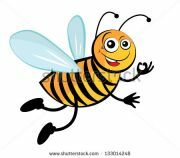 They say few substances are as antiseptic as bee propolis. It's a natural antibiotic that doesn't affect beneficial bacteria or cause side effects. So it is safe and simple to use on you and your dogs. WE WOULD LOVE TO HEAR ABOUT YOUR EXPERIENCES WITH OUR PRODUCTS AND YOUR DOGS. PLEASE TAKE THE OPPORTUNITY TO WRITE REVIEWS ON OUR WEBSITE OR CONTACT US FOR ANY FURTHER INFORMATION.